Isn't this one of the most gorgeous designs you've ever seen? Just as art, I mean. The fact that it's a teapot does nothing for me as tea makes me gag. It's just a beautiful, sculptural piece. And with any luck I will be going to see it soon in its temporary home at the Design Museum in London where it is part of the Design Cities exhibition. 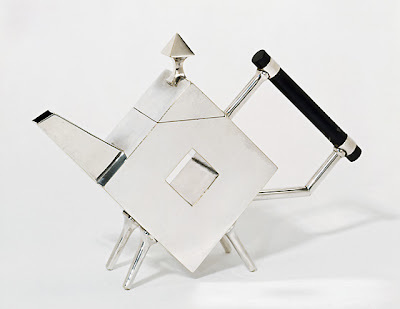 The Christopher Dresser teapot is one of the earliest exhibits, dating from 1879. I love the geometric form, it's forward looking yet timeless, and would look as good in a modern home as it did in the Victorian household it was designed for. Good design never ages, does it? To see more of Dresser's work, including beautiful arts and crafts wallpaper and the cutest watering can ever, go here. I love tea, and I love that teapot!